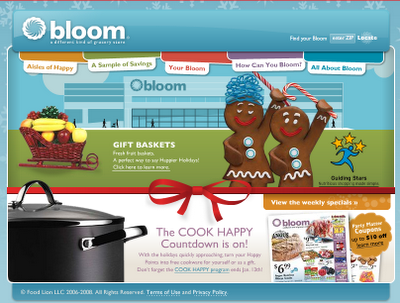 Bloom, a relatively new entrant to DC grocery marketing, blossomed in Rockville last year. And blossomed it did: there isn't one department that isn't simply splendid. The store features a good bakery, prodigious produce, delectable meat and seafood, and just about everything else you can imagine. Unlike Safeway or Giant, it is actually fun shopping at Bloom. Bloom's marketing department created a glorious look and feel for the chain. The corporate palette includes saturated food-based colors, such as avocado, apple red, blueberry, plum, and wheat. While the logo's lower-case lettering conveys a friendly openness, the store's icon seems like it will start to spin any moment, leaving shoppers feeling energized and excited. All of this sounds great because it is. But Bloom suffers from two enormous problems: ridiculously high prices and virtually zero customer service. Grand total? $19.77. For ONE meal! I realize that we're in a recession/depression and that it's the middle of winter and the vegetables are out of season, but c'mon, this is ridiculous. I wasn't making filet mignon, for God's sake. Bloom proves to be simply too expensive for weekly shopping. Next time, I'll go in for the steak sale and leave with one package of meat - that's it, that's all. Problem Number 2: At Bloom, you get virtually no service. When you first enter the store, you are faced with a huge rack of self-scanning devices. The idea is that you scan products before you place them in your cart. When you are finished shopping, the device calculates your total and allows you to pay via a self-service kiosk when you are finished shopping. I tried this exactly once. It took me at least twice as long to do my grocery shopping using this newfangled pricing gun. Forget it. My time is worth a lot more than that. I want to get in and get out, no matter how pretty the store is. Bloom's we-offer-no-service pledge goes deeper however. The store's employees routinely badger shoppers into using the self-check out aisles. During a busy shopping day, Bloom opens six self-service lanes and only ONE full-service lane; full-service means you have someone scan and bag your groceries. Not a lot in terms of service, right? Don't you expect your grocery store to provide grocery clerks to ring up your groceries and bag them? At Bloom, the management apparently thinks customer service is a big luxury - one they are are not going to provide if they can possibly help it - even if you are paying through the nose for their products. I don't think the gas station self-service approach works in a grocery store environment - especially one that charges you a premium price for groceries. America started pumping its own gas during the 1970s gas crisis because it cost us less to fill our tanks. We might consider scanning and bagging our own groceries if it meant we could save some dough - but Bloom is asking us to serve ourselves and pay a higher price to do so. Bloom's brand suffers greatly under these policies. Bloom could be greatly improved by lowering prices and increasing the number of open full-service lanes. Without these changes, the company will surely wither otherwise. To paraphrase a comment I received on my Facebook today... WWWWWWAAAAAAAAAAHHHHHHHHHHHH! I actually did know that Bloom is owned by Food Lion... and you know what other store is? Bottom Dollar, that cesspool grocery store I now shop at because I'm watching my pennies. I won't buy the meat there because the store is so filthy, but the packaged goods are fine - and cheap. Interestingly, Food Lion has high-end stores in Montgomery County(Bloom) and low-end stores in Montgomery County (Bottom Dollar) but zero intermediate stores (Food Lion) in Montgomery County. You have to go to Southern Maryland or the Baltimore suburbs to find a Food Lion. Still whining about missing the Trivial Pursuit party... you'll have to have me over to play someday soon.